every year since i have started school at byu, i've wanted to go to the lighting at the riverwoods in provo. this year, isaac made my dream come true! i was expecting lights hanging on the shops and on the trees, but let me tell ya…it was so much more than that! there was an ice sculpture, a christmas tree made of lights, a santa house, fire pits blazing, music, and lights everywhere i turned! the fireworks show was the best show i have ever seen! utah christmas fireworks are way better than california fourth of july fireworks (time to step up your game california)! it was freezing cold, so luckily i had my love to snuggle with! it was so beautiful and i'm thinking this will be a new christmas tradition. So fun! 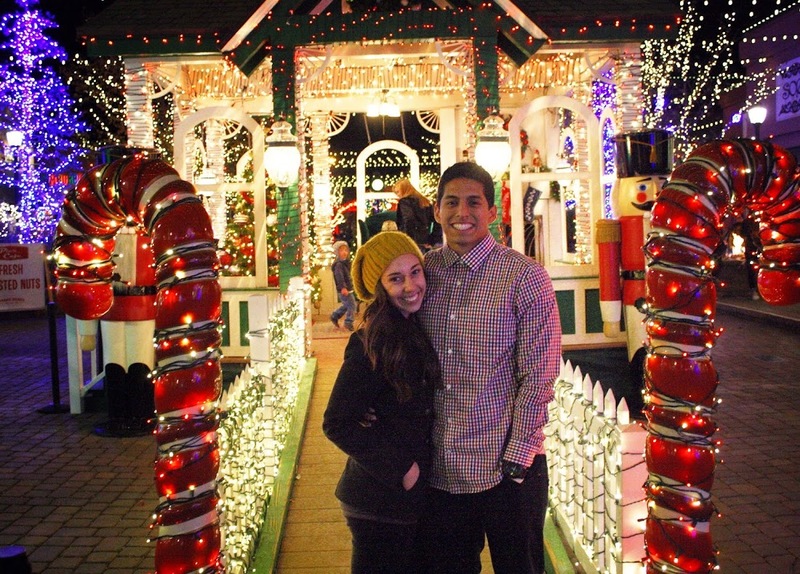 We'll be moving back to Utah in December and I can't wait to see all the Christmas lights. we went last year & i totally fell in love! riverwoods is such a magical place, ESPECIALLY at christmas. (and i'm kinda bummed i didn't run into you there.) you got some incredible pictures of the lights, though! WOW. I love how you're wearing a beanie, coat and looks so cold yet your fiance is wearing (what looks like) a light long sleeve. I also know how crazy cold it's been around here in the evenings. I swear every guy does this. They always under dress because I swear their body temperature equals 100 thousand degrees. hahahaha! okay that is so true! i have to bundle up and he's totally fine in that light thing! preach it girl. so cute! ahhh.. christmas lights are so fun :) we have a lighting festival/parade in the city of chicago, too. they are the best! a chicago christmas sounds amazing :) i hope you have an amazing christmas season, thanks for reading! that looks absolutely gorgeous! such a cute date idea! Gahh I'm needing some Christmas light mingling in my life! My husband and I love watching Christmas movies together each year, I guess that is our little tradition. christmas movies are the best! isn't it just the best season? So pretty! I'm ready to go all out with Christmas cheer, trying to hold it in til day after Thanksgiving but it is hard haha! Here in Albuquerque we have an event kinda maybe like that called the River of Lights and it is so pretty: http://offdeadline.com/river-of-lights/ Can't wait to go again this year! !